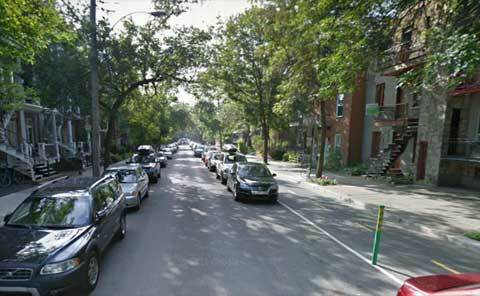 Usually, Urban segregated bike lanes (cycle tracsk) are perceived as safer than non segregated one, by many cycle advocates and public alike. 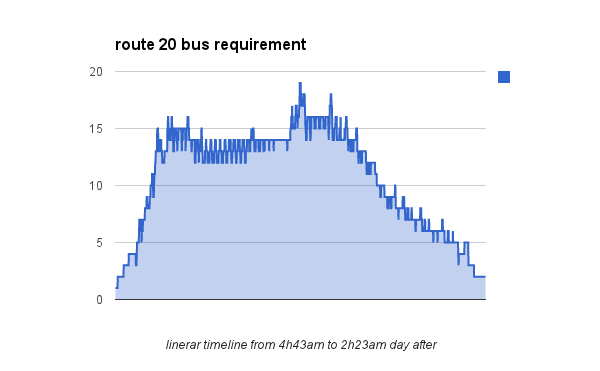 Alas most accident statistics say otherwise, and most scientific studies conclude, consistently overtime, that segregated bike lanes impair safety by ~20% ( summarizes and complete previous studies, see also a list of studies at ), some older studies putting this number up to 4 time higher . The most recent study extended to the USA by the same authors, , seems to suffer similar flaws . 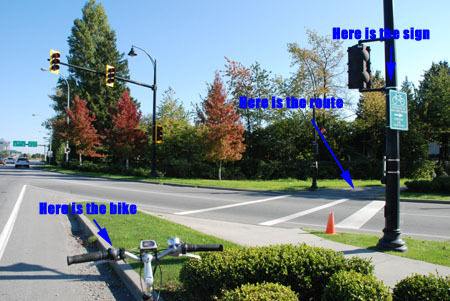 In urban area, most of the cyclist accidents are due to conflict with motor vehicles (85% in French cities according to the OSNIR), and most of them occur at intersection: In Canadian cities, 50% of fatal accidents and 72% of accidents resulting in serious injury occurred at intersections . 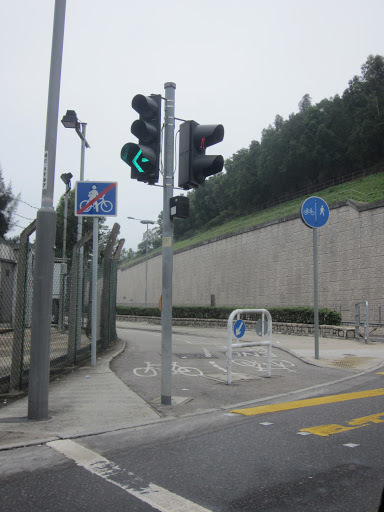 Cycling Commuters are generally not impressed by those treatments, which are just slowing down their commute, even when the obligation to walk the bike at intersections (Hong Kong case), is obviously widely disregarded by cyclists using such facilities. 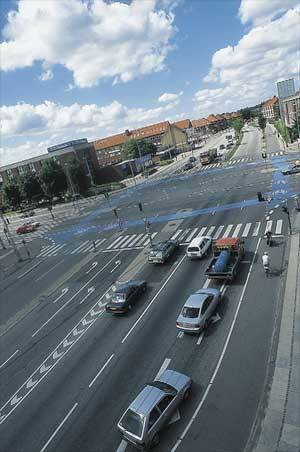 It has been “invented” in Copenhagen in 1981: The basic idea is to mark the area of conflict between motor vehicles and cyclists so road users pay more attention to this conflict and cyclists have a lane marking through the junction area. 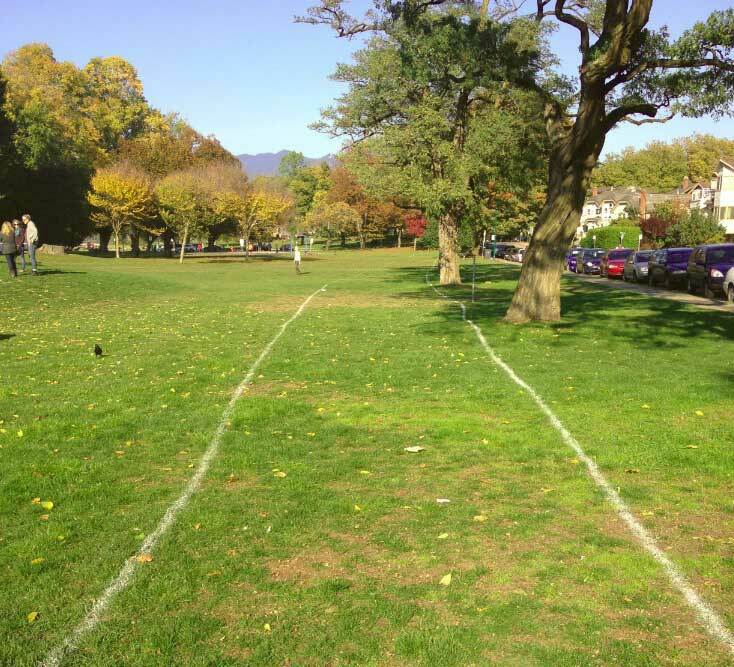 Alas, while it is found effectively reducing the number of accidents (and injuries) with one line, it increases it with 2 lines or more, according to . 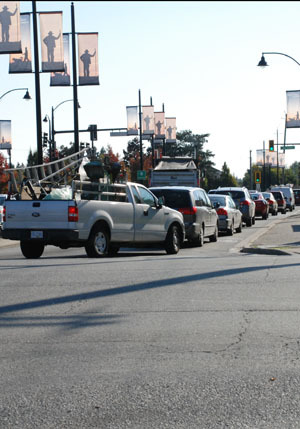 A reason for that is that, it becomes too much solicitation for the motorist than he can process – resulting in an increase of rear ending collisions and red light runnings; and provides a false “sense of safety” to the cyclists, becoming more complacent- not doing head check or using hand signals according to – what is consistent with the “naked street and risk compensation theories. 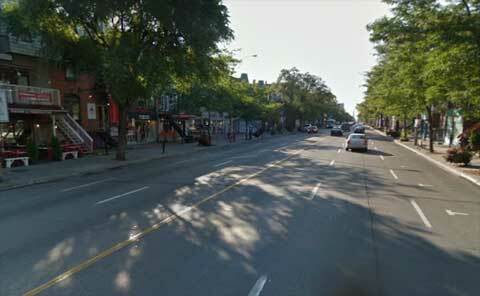 Should we be Against the separated bike lane? Both generate passionate debates, and unfortunately, both generate biased scientific literature too. Opponent to the helmet laws, will explain that, while the safety of existing cyclists is important, it is not paramount- One have to take a more holistic view to assess the benefit/drawback of such safety tool than the existing cycling population- and opponent to the helmet laws, without necessarily denying the positive safety effect of the helmet on an individual, will oppose to a law on the ground that it discourages sufficiently cycling to have a general negative effect for the society. 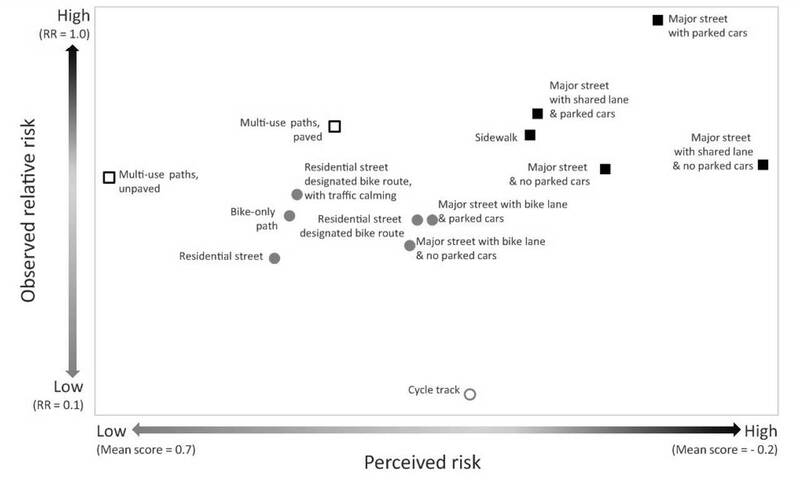 Risk of injury for bicycling on cycle tracks versus in the street, Anne C Lusk, Peter G Furth, Patrick Morency, Luis F Miranda-Moreno, Walter C Willett and Jack T Dennerlein, Injury Prevention, February 2011. doi:10.1136/ip.2010.028696. Route Infrastructure and the Risk of Injuries to Bicyclists: A Case-Crossover Study, Teschke K, Harris MA, Reynolds CC, Winters M, Babul S, Chipman M, Cusimano MD, Brubacher JR, Hunte G, Friedman SM, Monro M, Shen H, Vernich L, Cripton PA., American Journal of Public Health: December 2012, Vol. 102, No. 12, pp. 2336-2343. Conclusion of both  and  are drawn from a study carried from May 2008 to Nov 2009 in Toronto and Vancouver. 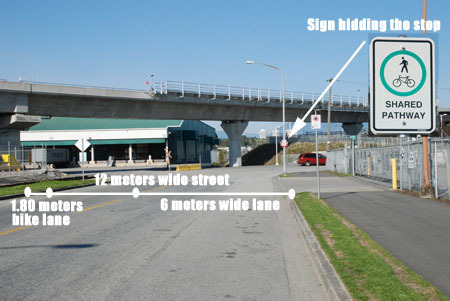 To the bets of our knowledge, it was no “cycle track” in Toronto, and the only ones able to qualify in Vancouver, were an experiment started on July 2009 on Burrard Bridge, with no intersection along the ~1km cycle track segment, and a ~300m segment in one direction on a quiet street (Carral street) with ~300 cars at peak hour with only one very quiet intersection (Keefer street) featuring ~120 car at peak hour (From City of Vancouver’s 2006 traffic count) what is barely representative of a typical cycle track: The result provided for the cycle tracks is hence certainly irrelevant, and that is the reason it stands as an outlier. draws conclusion by comparing current crash rate on some cycle tracks with some numbers collected, sometimes in specific situation- like a study on Boston’s bike messengers- more than 10 years ago, without correcting them of external factors, like significant general crashes reduction rate in the last decade, and well documented safety in number effect affecting more particularly the cyclists. 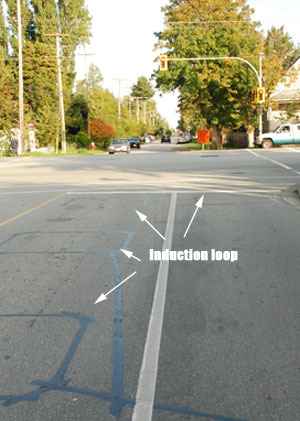 Furthermore, one could argue that the “crash rate” is a very poor, if not uncorrelated, proxy, to qualify the safety of a road infrastructure: Roundabout are well-known to increase the rate of crashes, vs a signaled intersection, but they are also well recognized to reduce the risk of serious injuries, most of the crashes being limited to fender-bender type. In other word, a crash rate ratio is not representative of the safety social cost of an infrastructure…what ultimately matter. More awkward  suggests that “The AASHTO recommendations may have been influenced by the predominantly male composition (more than 90%) of the report’s authors” without being able to substantiate this assertion, showing that we have here more a opinion paper: attacking the gender of authors to disqualify their works, seems pretty petty at best! 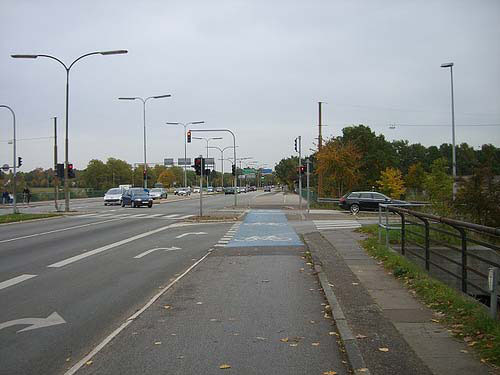 Vulnerable Road User Safety: A Global Concern, Transport Canada, 2004. 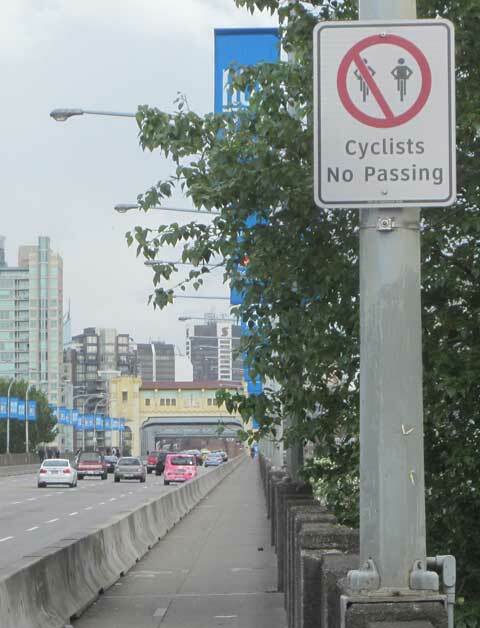 A B&W sign seems to indicate a bike lane, motorists have a different opinion. 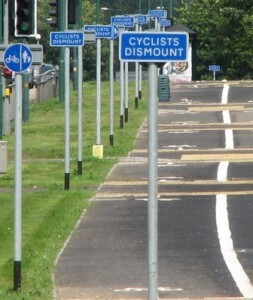 A green sign indicates direction against common sense that cyclists also rightfully ignore. 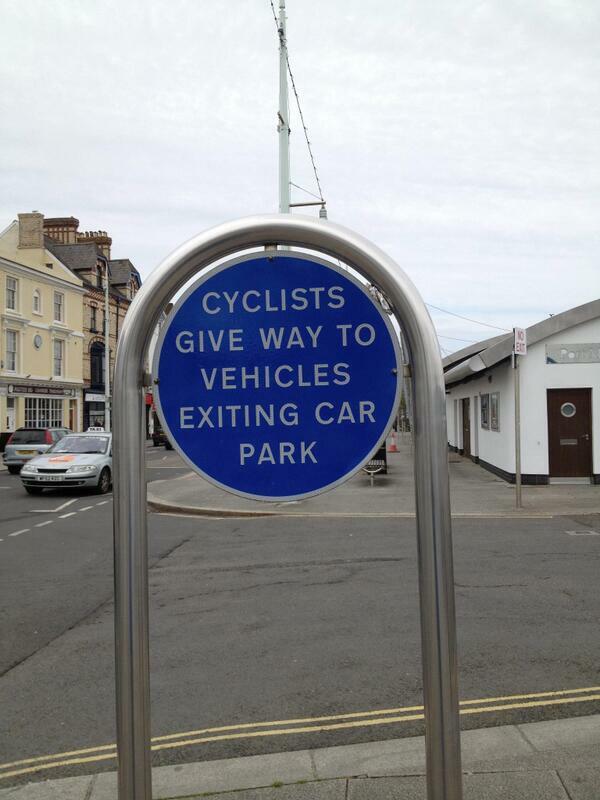 It is not the least advantage of a cycle lane to behave like a legal, safe, and comfortable queue jumper, avoiding inhalation of polluted air by cyclists on congested road, and making this mode more competitive with other commuting choice. 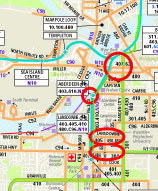 basically, the Richmond city center is serviced by a a backbone of 2 bike lanes, the north-south bike lane,along the path of the former interurban (gardencity, Granville and railway) and on the east of Garden city by an East-West bike lane along Westmintser hwy. 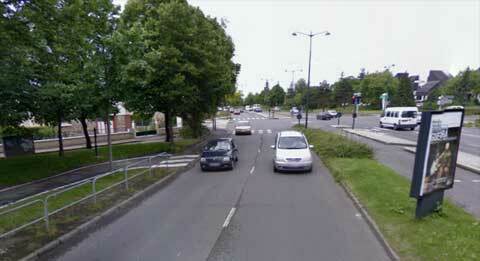 In despite of some commendable effort in the right direction, like the raised bike lane on the road 3, bike lanes are still fairly disconnected and basically don’t provide much needed connections to the Canada line or the Kwantlen college. A recent addition to the bike lanes netwok has been the connection of the Canada line bridge to the rest of the bike network through Van Horne road in an industrial precinct…but probably that the 12 meters wide road was judged still on the narrow side, so a bike lane takes place in only one direction! (opposite direction is a shared path). 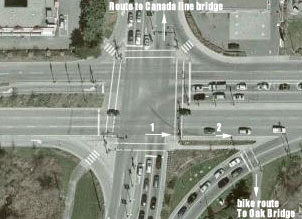 Notice that in general cyclists use an alternative and more pleasant route via Riverport road. 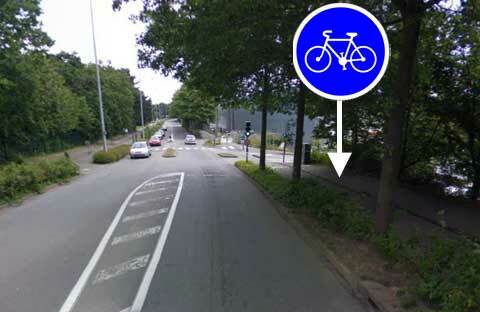 The 12 meters wide road was judged a bit too narrow to put 2 bike lanes in addition of 2 general traffic ones, so one of them end up on the sidewalk! 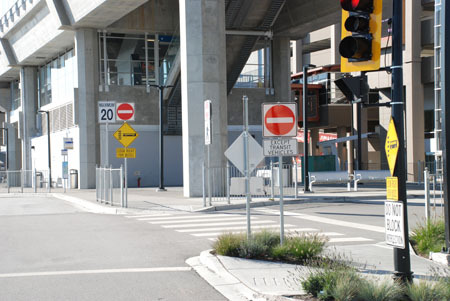 Notice how the shared path sign is hiding the stop...and which path is shared? 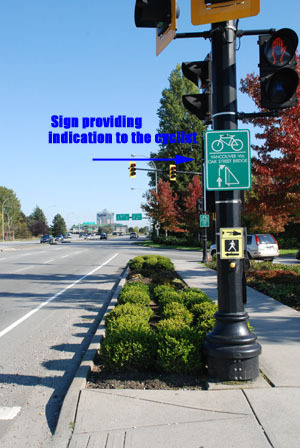 At Great Canadian way and Sea island way intersection, cyclists are the object of less care than the landscaping, and a cyclist following sign could put himself in an uncomfortable if not outright unsafe spot. 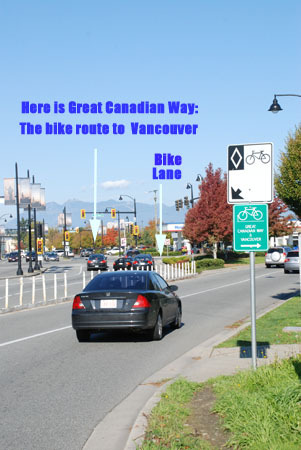 the great canadian Way and Sea Island way interstection from satellite or how the cyclist can evolve from West to East? 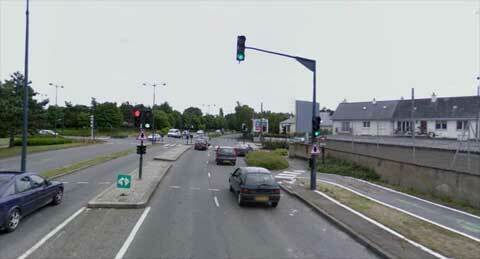 this traffic light goes green only if a car approach it, if you are a cyclist, you have to count on luck, and be prepared to waste tremendous amount of time...for sure another option exist! 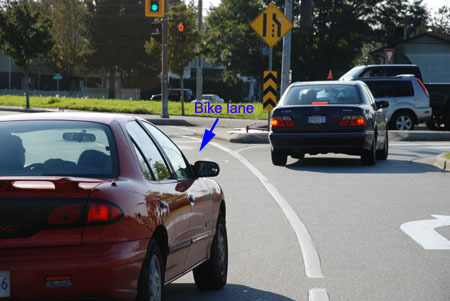 As the above picture illustrates, advanced right turn lane gives way to probably the most disconcerting disposition of bike lanes, de facto defeating the purpose of those bike lanes, which is to provide a secure environment to the cyclist. 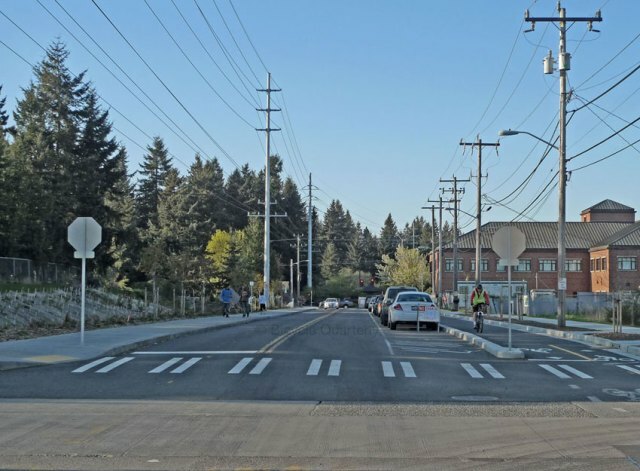 Motorists seems unsure on the way to negotiate a right turn with a bike lane in the middle of the road: some will pass a cyclist on the right… some others on the left before tail gating the bike…. 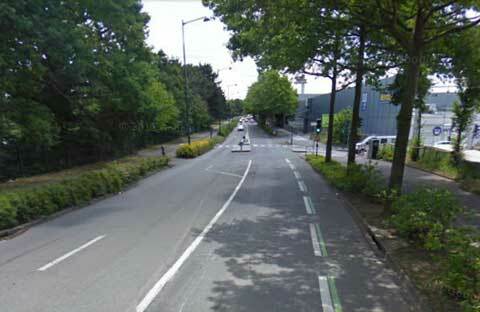 In Richmond, yield to cyclist is definitely not an option! 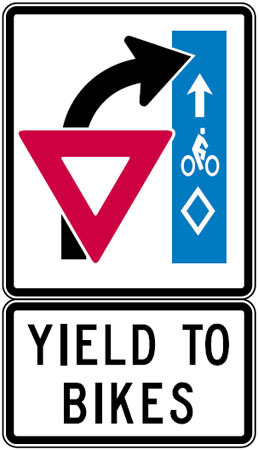 In cyclist friendly jurisdictions, Yield to cyclist is the only option! 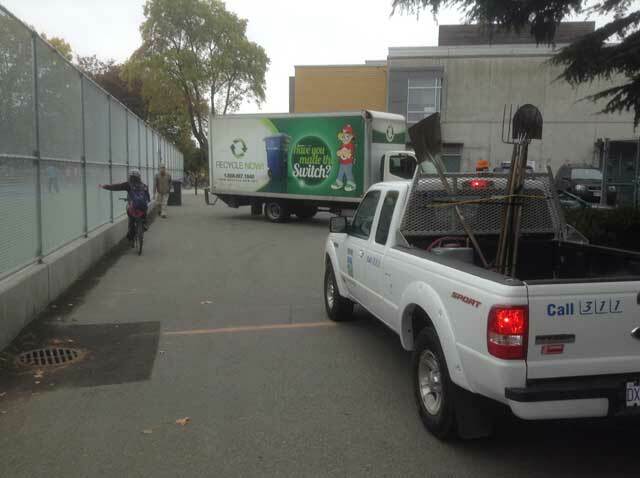 …and not surprisingly, those jurisdictions have usually much safer road safety record than BC. 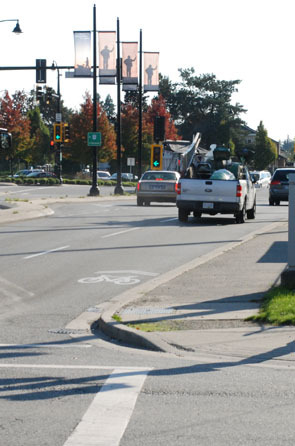 Richmond BC, is like a child learning to bike. 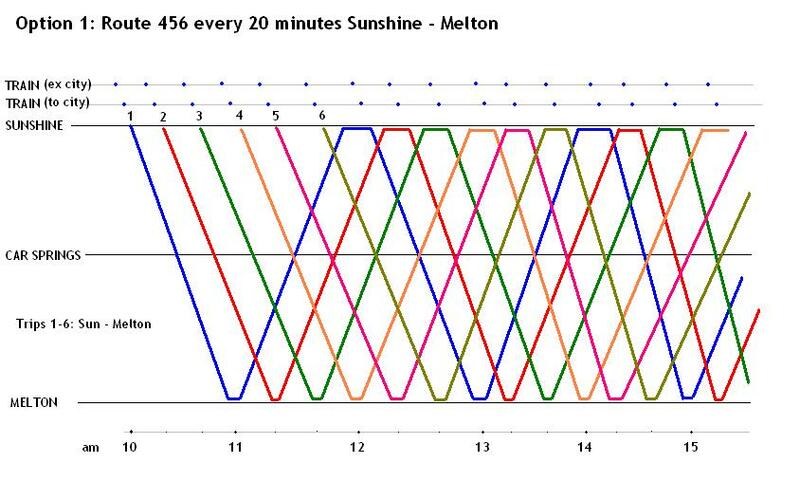 It seems to be full of good intention, but lack of understanding and method. European cities was not much different a quarter century ago, it is just that Richmond needs to work much harder in order to not fall behind. While, it is generally the law to yield to cyclist, like to pedestrian, on a right turn in Europe, law seems to be far less consistent across North american jurisdictions which usually don’t treat cyclist as a vulnerable user of the road, see bike lane and right turn difference in Oregon and California or, for a more awkward regulation, the Ontario MTO explicitly indicates that right turning vehicles have priority on cyclists. 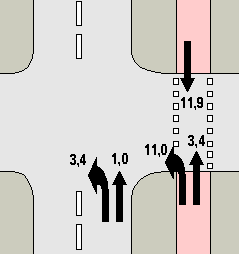 European countries, and more generally country adopting the Vienna convention road signage, use thick dashed lane as a horizontal “yield line” marking, the equivalent in North america is usually a line of triangle, used in New York City as illustrated in the video of the NYC DOT.